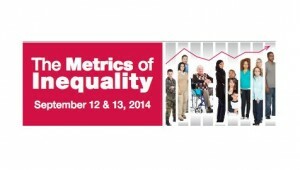 The John Marshall Law School Fair Housing & Legal Support Center presents The Metrics of Inequality Sept. 12-13, 2014. Income inequality strikes at the heart of the fair housing movement. Each of the protected classes contains large numbers of low to moderate income individuals. The inability of low and moderate income individuals to find affordable housing in stable and integrated communities prevents the full implementation of the goals of the Fair Housing Act. Despite the recent disparate impact regulation promulgated by HUD, fair housing advocates worry about the future of this method of proof in the courts. Attorneys and fair housing advocates often discuss disparate impact theories without a clear understanding of the use of statistics and how statistics and regression analysis relates to proving a charge of discrimination. This conference focuses on how attorneys and fair housing advocates can use statistics and social science data to establish violations of the Fair Housing Act. Speakers will discuss the effectiveness of using disparate impact theories in proving housing discrimination and new developments in promoting inclusive zoning. Experts from around the United States will convene to study and discuss these important issues and how social science data can be used to implement an effective fair housing agenda.